The 2011 Government ICT strategy preaches standards. Tick box = Good. People who bore for standards preach, ‘to do it properly you must define the standard and check later that the standard has been followed’. This blog compares the strategy against a standard (standard with a small ‘s’) – in this case against the same set that was used to review the SOCITM ICT Strategy, released in draft last month. Everybody must agree with this, and observe that sharing information across multiple agency boundaries is critical for citizens, businesses and agencies. It has led to much discussion about shared infrastructure, shared services and the benefits this will bring. Fortunately, we can use a standard for quality assuring the Strategy and highlighting any gaps that need to be addressed. 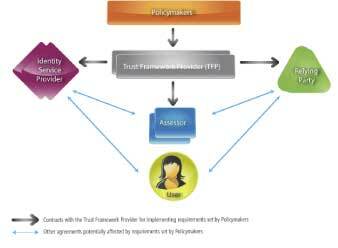 It has nine dimensions for assessing multi-agency information sharing partnerships. The reasons are good and there is an aggressive, but risky timeplan. Dependence on on word ‘Agile’, is a recipe for systemic obscuring of progress. It provides opportunities for hiding problems that only emerge when the end-users in multiple location are expected to change time-honoured processes, and new systems are not interoperable with old systems. The needs of 450 local authorities must not be ignored. A structure has been developed, but it omits the input of local delivery agencies, such as local authorities. Use of open standards and APIs will help at a programmatic level, but additional useful services, such as Master Data Management and systems interoperability standards are not mentioned. Avoidance of a cross public sector strategy for citizen, employee and agent identity management risks complete failure of the strategy and policy objectives will not be met. Federated trust by all involved agencies is vital for both accuracy and efficiency. Nowhere is this mentioned or implied. The overwhelming weight of the document is technology and infrastructure, there are eleven actions planned. However, one suspects that the thought process has ignored local government and external agencies in the calculations. Are local authorities expected to reduce ICT costs by 35%? The standard means to ability to sustain a shared service for operation over many years, not reducing carbon usage. Most shared services fail because of the inability to agree funding for operations, and all the development investment is wasted. Central Government must agree a sustainable funding model at the very beginning of every information sharing project. The Cabinet Office should feel responsible for the whole of the public sector, not just central government departments and agencies. So how do you react to 3 Reds, 4 Ambers and 2 Greens? It is low on Process and Governance and higher on Technology. Quarkside thinks it is good enough for a first draft to get the ball rolling. But if Francis Maude thinks this document is going to deliver all his policy objectives, then I fear that he, or his successor, is set for a big disappointment and some explaining to do. eID in a federated environment has many complex governance aspects. It does have a major impact in the applications which may use it. Stian Sigvartsen has been running a blog for a couple of months on “Achieving a federated single view of the customer“. The benefit of the postings is an exposure of some technical detail. Take a look if you are that way inclined. The broader message is that the human brain is the most cost effective processor of short lists of potential identity matches. Matches are often obvious when combined with local knowledge and it is possible make assertions of identity with an indication of probability. Records would show the eID of the asserter and a time stamp. All assertions can be then incorporated into incrementally improving federated searches. Audit trails would then be so much easier to follow. These concepts need to be built into all identity registration schemes, such as Individual Voter Registration. Does the Cabinet Office talk to the Cabinet Office – or any other Department for that matter? Last week’s Local Government Delivery Council also had two related presentations; “Identity Assurance for Public Services” by the Cabinet Office and “Employee Authentication Services (EAS)” by DfE and DWP. Put these into the context of “HMG CTO Council – Government Employees Strategy for management of Identities – Version 1.1 – 1 February 2011. ” This noble document has some excellent content as far as it goes – but look at the juicy bits it deems out of scope. Most, if not all of these are required by real live systems, especially in Local Government. They are probably the hard bit where most guidance is needed. Federated identity management protocols do understand how to include these options. For example the use of Shibboleth 2 in the education sector can easily differentiate between children and teachers in Web based application systems. EAS has been around for years in DWP. It has been recently used for the “Tell Us Once” (TUO) project, authenticating for multiple agencies handling common citizen data. They have discovered the need for, and have implemented, some employee attributes that allow differential access to application systems. This is out of the scope of the strategy above, but they found they had to do it. Every Local Authority (LA), and there are hundreds of them, needs guidance on this because most do not have the internal skills and knowledge to interoperate with external identity providers (like EAS, but there are lots more). A common standard for federating identity, supported with standard software, is the only sensible way to proceed. Oh, and by the way, it will run on the GCloud. Trebles all round. Does the Identity Management industry, working with hundreds of LAs, have the capacity to deliver in such a time scale? Does the Cabinet Office (or anybody else?) have a Technical Architecture that is fit for purpose and compliant with the CTO Council strategy? Identity management ignorance crippled the development of ContactPoint – why is it so much easier and simpler for Universal Credits? This is a quote from the Mydex white paper on “The Case for Personal Information Empowerment”. I can only agree. 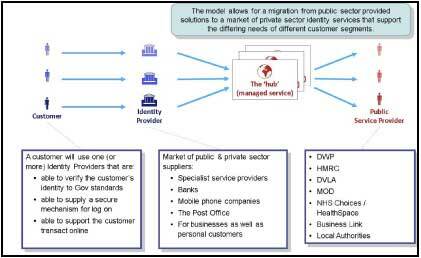 The UK is in urgent need of a cross public sector identity mechanism. It must not be centralised, to avoid being blocked by the anti-totalitarian brigade. It must be as part of a trusted federation. Many agencies can issue credentials after due process, but all agencies should accept them up to agreed levels risk. Yes, we need standards first – but who is working on them? Which agencies should should be certified to issue federable public sector credentials?